Non-academic questions regarding special services, phone numbers, web-sites, library policies, current procedures, technical notices, and other pertinent local institutional information are often asked at the academic library reference desk. These frequent and urgent information requests require tools and resources to answer efficiently. Although ready reference collections at the desk provide a tool for academic information, specialized local information resources are more difficult to create and maintain. As reference desk responsibilities become increasingly complex and communication becomes more problematic, a web database to collect and manage this non-academic, local information can be very useful. At the Oregon State University, librarians in the Reference Services Management group created a custom-designed web-log bulletin board to deal with this non-academic, local information. The resulting database provides reference librarians a one-stop location for the information and makes it easier for them to update the information, via email, as conditions, procedures, and information needs change in their busy, highly computerized information commons. Where do I get my thesis bound? How late is the computer lab open? How do I set up an email account? These questions can't be quickly answered from traditional printed reference sources, but they are the type of questions encountered at academic reference desks every day. Most libraries have developed tools, such as vertical files, static web pages, and index card files, to deal with these questions about local services and to provide institution-specific information. At Oregon State University (OSU), expansion of the Reference area into an Information Commons has increased the number of questions of this local, non-academic nature and has stretched these traditional printed tools to their limit. The Information Commons, a complex suite of library and computer services, has broadened the scope of responsibilities and knowledge needed by staff at the reference desk. The library offers general web access and is taking on more computer lab functions. Consequently, the staff is being overwhelmed by a plethora of frequent and urgent information requests. While some of the answers to these questions are stable, many are ephemeral. All of the requests require awareness of and quick access to resources to provide adequate answers. For instance, students and university staff come to the library to register for classes, meet with the writing and mathematics consultants, pick-up remote access communication software, get help with connection problems, obtain statistical assistance, and get help with other, previously decentralized, services. Furthermore, the library has expanded the use of the web to support special library assignments, schedule rooms for group meetings, and provide electronic classrooms. The library provides word processing and presentation software and checks out laptops. The hectic environment of the Information Commons has made the traditional reference desk paper resources -- card-file, clipboards, manuals, and directories -- more difficult to maintain and update. At OSU, librarians had created and used a number of tools in physical format: a card-file of frequently asked questions, phone numbers, addresses etc., arranged alphabetically by keyword; a printed manual which included policies and procedures and passwords to databases; and a clipboard that held copies of email through which reference staff kept each other updated about class assignments and other pertinent information. But these tools were difficult to manage and maintain. Only a few enterprising librarians volunteer to contribute to the local information resources and few have the time to maintain and update them. The reference staff soon becomes weighted down with trying to find answers in sources haphazardly stored and often outdated. To address this problem, the reference desk management group decided to replace these physical format tools with a comprehensive web database solution. This web application would be designed to function like each of the paper compilations, but would make information more conveniently accessible. Additionally the group felt that a web database that could accept email updates, centralize storage and maintenance, and provide access at any networked computer would leverage the efforts of the reference desk. Many service points throughout the OSU library would benefit from cross-communication and the sharing of information to enhance public service. 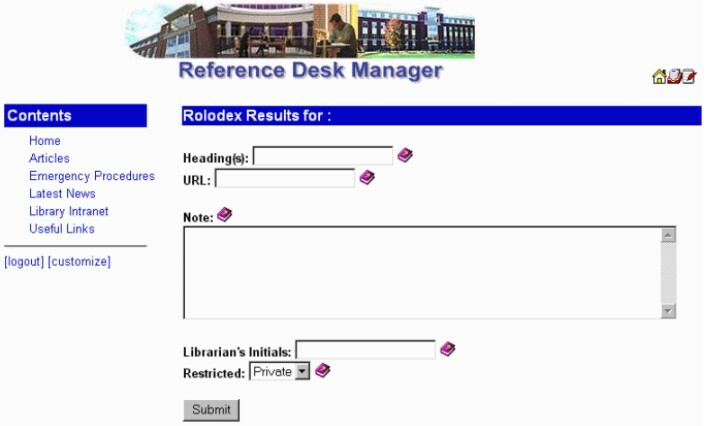 The database the group created is called Reference Desk Manager (RDM) and it facilitates this information sharing by allowing other divisions of the library to include local information in the RDM web application within separate but sharable modules. The possibility for sharing critical information is only limited by the motivation and imagination of the participants. This article describes the design and salient features of RDM. It provides a brief description of RDM programming strategy as well as a description of the working prototype. This is followed by evaluation of RDM and description of how this program affected workflow. Finally, for other libraries that may wish to experiment with RDM source code, information for downloading RDM is provided in an appendix to this article. When the web application to store local information for reference was first conceived, four distinct kinds of information resources were identified. Electronic card-file-type data containing addresses, phone numbers, web addresses, library hours of operation and other concise, semi-stable information. Policy and procedures information that is more complex, lengthy and permanent. Information about class assignments or of a technical nature that is more lengthy and complex, besides being more ephemeral because the condition in which the information is relevant changes. Local information of a stable nature such as local web addresses that lead to important local interfaces and research gateways. RDM was designed to store and provide access to the above types of information resources and includes: a combination of a keyword-searchable electronic card-file; "topical issue folders" that contain email messages sent to reference desk staff; hyperlinks to electronic documents containing library policies and procedures; and answers to frequently asked questions (FAQs). Reference staff can access and update RDM via a web interface. RDM has the characteristics of a web-log archival messaging system, searchable database, windows folders, and web page link lists. (See Figure 1.) A searchable database of FAQs is at the top of the page. This part of the RDM database was populated with information from the library's printed card file. The entries can be searched or browsed by keyword. The Reference Desk Email section is similar to a web-log. Web-logs are a popular method of communication for web-site users. Some web-logs host a messaging system that allows users to input messages in a threaded discussion. RDM eliminates the threaded discussion because each email submission to RDM functions as a final entry to the database. Links to frequently used campus services outside of the library are located on the right side of the folder. Email messages in the Reference Desk Email folders, electronic card-file entries, and web links are all stored in a MySQL database loaded on the library's unix server. The users of the RDM system see none of the backend database details. They only see the editing functions of the web interface. 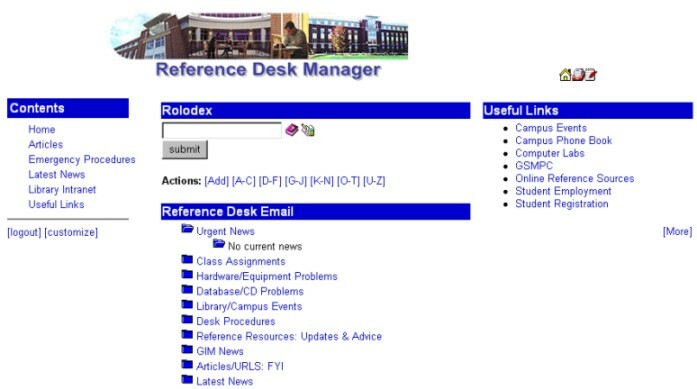 Figure 1: Reference Desk Manager home page. Most reference desk issues are first brought up in email communication. Hence, the ability to forward email to an archival database is a chief feature of RDM and allows broader reference staff participation in and responsibility for updating the information stored there. At first, the designers of RDM envisioned that each email submission could be tagged with codes to allow direct input into a subject folder. However, it became apparent that this would discourage use of the database, as staff would have to memorize some 8 - 10 tags corresponding to the folders. Therefore, currently all email is sent to the �latest news� folder, which then can be parsed into various subject folders. A designated RDM administrator on the staff is responsible for culling and sorting the email, adding users, and dedicating issue folders. Email sent to the log is forwarded to a dedicated email address. When a user logs into RDM, a PHP (server-side, cross-platform, HTML embedded scripting language) script queries the account, downloads the email headers, and writes them to a web page. At this point, users can move the messages to any of the defined folders in the email system. Messages remain within the dedicated email address until they are moved to a defined folder. Once the messages are extracted from the dedicated account, they are stored in a MySQL table. Once in the database, the messages can be moved, deleted, revised, or answered. Urgent News: This folder is for important items that all reference desk staff should read immediately. Subject headings for these items appear under this heading on the home page to draw the attention of the staff. Class Assignments: Students are often assigned research that requires using the library. This results in large numbers of students approaching the reference staff for help. Having the reference staff prepared with ready hints and solutions to particular assignments makes reference duties more efficient and provides better service to students. In this folder, subject specialist librarians share their expertise with the rest of the staff by providing specially designed web pages, lists of local resources, and search strategies for assisting the librarians and students. Hardware/Equipment Problems: Technical problems have increased at the desk as the general reference environment becomes more like a computer lab and the expectations of users rise. Keeping printers functioning, maintaining various specialized terminals, having knowledge of general connection and access methods, and knowing whom to call when problems crop up with the technical tools used in the Information Commons is an important function of the reference desk manager. Database/CD Problems: Librarians must know how to provide solutions to library database problems. This folder provides solutions to specific problems and offers crucial contact information to reach the right maintenance person. Library/Campus Events: Special events take place in the library or throughout the campus every day. Instructors use electronic classrooms, conference attendees use the public email computers, etc. The Library/Campus Events folder provides crucial information about many of these events. Desk Procedures: This folder contains information regarding the mechanics of opening and closing the reference desk and keeping track of procedures that help the desk run smoothly. Reference Resources: Updates & Advice: Contained in this folder are general articles pertinent to good reference desk services that provide an ongoing training forum and current awareness tools for the staff. Located here are email messages with links to articles on reference interviewing methods, subject-searching strategies, and other issues related to quality reference service. GIM News: This folder is for updates on issues related to the Government Information and Maps Desk. Articles/URLS: Other miscellaneous websites and publications that could be useful, but that don't fit into any of the previous categories are stored in this folder. Latest News: New email messages that haven't yet been filed in a topical folder may be found here. Because the editing of named folders is easy in RDM, the staff can experiment with the folders. With the assistance of the RDM administrator, it is easy to eliminate folders that are found to be of little use and to add others that might be needed. It is expected that this tool will evolve as reference desk conditions change. Figure 2: Reference Desk Manager Web form to add information to FAQ database. Figure 3: Web form to modify information in the Reference Desk Manager database. RDM's web links section can be designed to meet various needs. Since there are differences in approach to answering reference questions while using the library web pages, the reference division has not completely agreed upon what the exact nature of these links should be. However, currently most links are being selected from heavily used web services in the library and other campus servers. The RDM team believes that the ability to adapt the web links section is one of main values of the RDM system. Providing links to general library web pages such as the research gateway, library home page, university home page, local statistical sources, etc. increases access to the main library services. The main web application home page breaks down the hierarchy of the library web pages in a way that reflects the most frequently used pages in reference service and instruction. Clearly, one advantage of RDM is that it gathers in one place all information needed to address questions about institutional and local services. Because RDM is on the web, it is accessible at multiple service points, including the Government Publications and Maps Desk, the Circulation Desk and the General Reference Desk. Another advantage of RDM is that it is easy to update. Any staff member can input new entries directly into the FAQ database or send an email message containing information to be included in the topical folders. RDM does not solve the problem of information becoming outdated, however. Staff must continue to review the contents of the database for accuracy, but it is hoped that this will be a much less onerous task now that updating information can be done online. Furthermore, some updating procedures can be automated. For example, with simple modifications of the code, reports can be generated of entries that have not been updated since a certain date. Future possibilities of automating the process of providing local information include tagging some of the ready reference information in the database for porting into the general library web site so that library users will not have to involve the reference librarian in order to obtain answers. Additionally, recent discussions have taken place about merging the reference desks and technical service desks, which would result in more communication about technical problems within OSU's Information Commons. RDM's role of facilitating communication between the public and technical services staff is obvious to many. One of the greatest strengths of RDM is its ability to scale to users' needs. By using MySQL as the application's backend database application, there seems to be no limit to the number of modules or data elements that can be added to RDM. For normal use, RDM requires little or no maintenance in terms of table or data manipulation. Since all the information in RDM is added and/or modified by its users, and the RDM administrator is the one who assigns users, the application developer's work generally doesn't include database maintenance. During testing at OSU, the role of the developer is primarily to integrate new modules and design features into RDM. Since RDM was designed with expansion in mind, adding new modules to the application has generally been a fairly simple process. The Reference Desk Manager (RDM) design team believes that the potential for RDM to collect, store, and manage critical non-academic, local information at the library's public service desks is considerable. Because of the web, library computers have become proxy service points for other university units. Students are using the OSU Web in the library to register for classes, take online quizzes, open computer accounts, do general word processing, etc. The reference desk staff are taking on more administrative and technical questions in addition to general reference questions in support of library databases. This makes effective communications between the library and other university units, between technical staff and public service staff, and between one librarian and another even more necessary. Application development to solve the evolving needs of reference and public service desks may prove more important to libraries in the future. 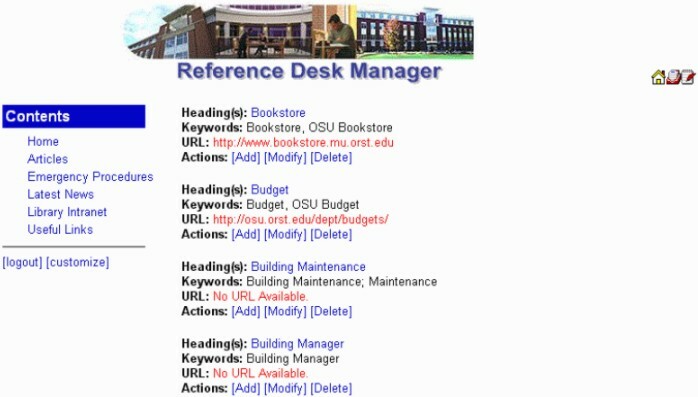 The RDM development activity has taught OSU library staff how to identify, specify, create and manage web-based tools that will facilitate the coordination of information within the library and throughout the university campus.